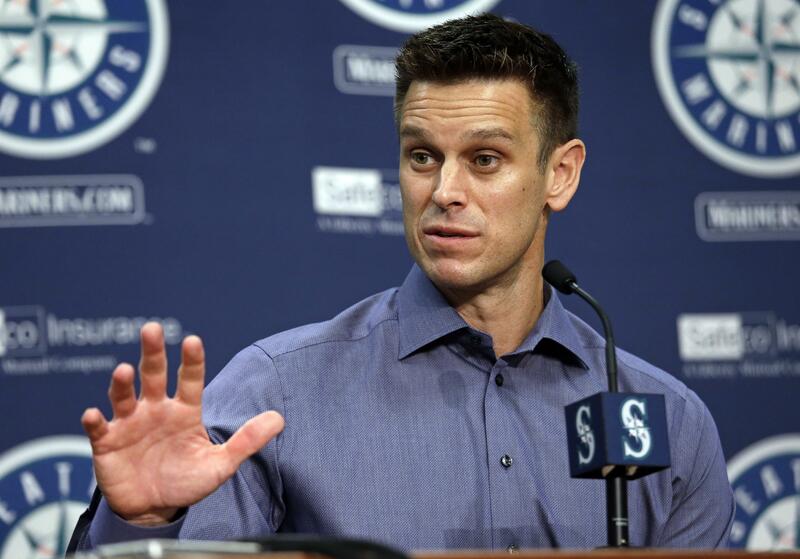 SEATTLE – The Seattle Mariners signed general manager Jerry Dipoto to a multiyear contract extension on Friday, a reward for the club being on track to end the longest playoff drought in the four major professional sports in the U.S.
Dipoto is in his third full season with the Mariners. Since the start of the 2016 season, his first full year, the Mariners have the eighth-best record in the majors at 220-192. “As I said when I arrived here, I believe this organization has every opportunity to be successful on a consistent basis,” Dipoto said in a statement. While there are still issues in the farm system, Dipoto has succeeded in making the major league product better. He’s turned over a roster that had aged and added key younger pieces such as Mitch Haniger, Jean Segura and Dee Gordon, who are all major contributors in Seattle’s start to this season. The trade that landed Haniger and Segura from Arizona before the 2016 season now looks like a coup pulled off by Dipoto. Dipoto also has locked up key parts of Seattle’s core for the next several seasons, either by having club control through arbitration or by signing long-term extensions. All of Seattle’s current starting rotation is under contract through the 2019 season and the only everyday player without club control beyond this season is designated hitter Nelson Cruz. Dipoto arrived in Seattle in 2015 charged with finding stability after the final years under Jack Zduriencik had crumbled. Dipoto was trying to rebuild his own career after a less-than-amicable departure from the Los Angeles Angels amid conflict with manager Mike Scioscia. Dipoto made countless roster transactions in his first year with Seattle, starting the roster churn that made the Mariners younger. Seattle won 86 games in 2016 before backsliding to 78-84 last year amid numerous injuries to the pitching staff. Seattle was thought to be a fringe playoff contender this year but is in the thick of the playoff hunt nearing the All-Star break. With Dipoto locked up the question will now turn to manager Scott Servais, whose contract is up at the end of the 2018 season. Published: July 6, 2018, 12:37 p.m. Updated: July 6, 2018, 3:46 p.m.